Since it’s the month of love and all, I’m posting my favourite “romantic” recipes. Obviously, macarons had to make an appearance! 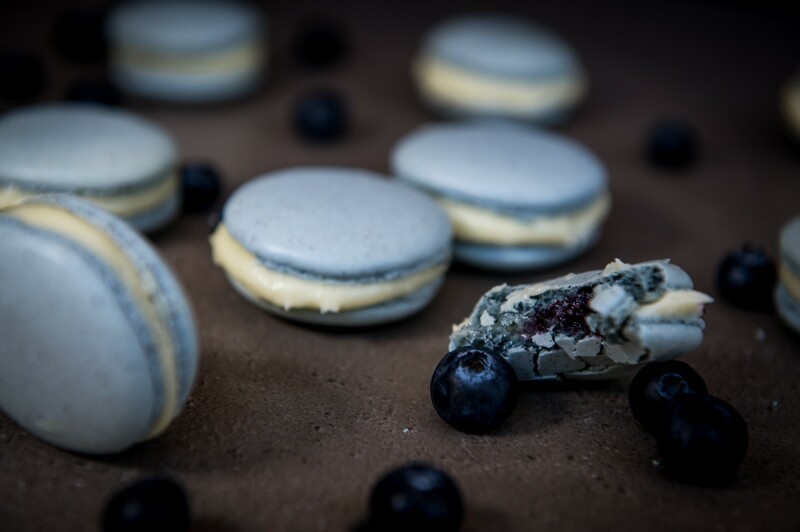 If you like macarons but find them a tad too sweet, these Blueberry Cheesecake Macarons are just for you. The cheesecake-inspired filling is rich and creamy but still a little tangy. And then there’s the fresh burst of fruity flavour from the blueberry compote. 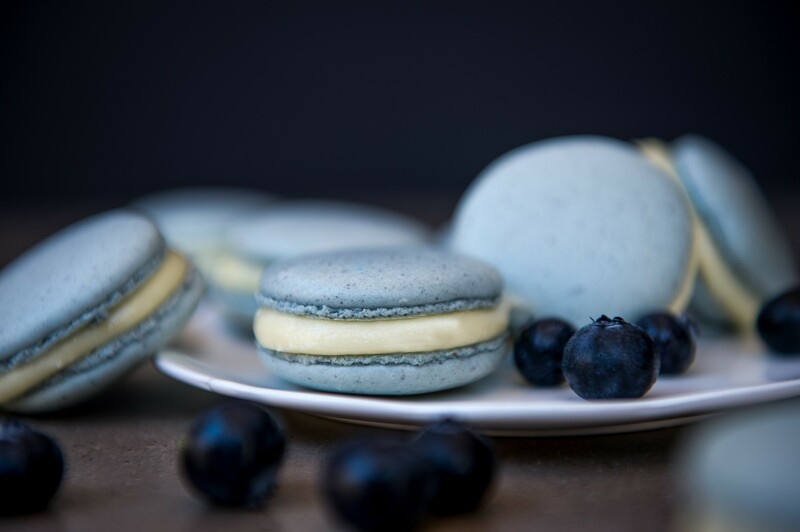 What really makes these Blueberry Cheesecake Macarons so gorgeous is the beautiful little speckles of actual dried blueberries. A bit like a macaron version of a speckled egg! That’s thanks to the addition of blueberry powder to the macaron mixture. To save some time, all three components can be prepared in advance, then simply assemble the macarons shortly before serving. PS. The macarons are also gluten-free! For best results separate your egg whites 1-2 days before starting. You will need 4 large egg whites. Keep the egg whites in an airtight container in the fridge for 24-48 hours. This is called “ageing” and reduces the moisture content of the egg whites. Weigh the egg whites after ageing. Start with the blueberry compote. Place the blueberries, 2tbsp water, sugar and lemon juice to a small saucepan. Stir over medium heat, until the mixture comes to a boil and the blueberries start to burst. Mix the cornflour into the remaining 2 tbsp water, then add this to the blueberries and stir well. Bring the mixture to a boil again, then turn the heat down to low and simmer for 2-3 minutes or until the sauce starts to thicken. Set aside to cool to room temperature, then refrigerate until cool and slightly set, about 2 hours. Preheat the oven to 160°C (without the fan). Line 2 baking trays with silicone or greaseproof paper. Draw evenly sized circles on the paper, 3-4cm in diameter (I traced around a tot glass). Turn the paper over so that ink/pencil does not transfer onto the macarons. To make the macarons, combine the sugar and water together in a small saucepan over low heat. Heat gently until the sugar has dissolved, then increase the heat. Meanwhile whip the egg whites (A) in the heatproof bowl of a stand mixer (or a hand-held mixer, but you’ll need help later) until foamy. Once the syrup has reached 116°C, remove from the heat and cool for a minute or until the bubbles subside. With the mixer running on medium speed, carefully pour the hot syrup in a thin stream down the sides of the bowl, away from the whisk. If you are using a hand-held mixer you will need an assistant to do the pouring here. Continue mixing until the bowl feels cool to the touch. Add a few drops of food colouring if desired. Sift together the icing sugar, almond flour and blueberry powder through a fine sieve. Make sure to push all the almonds through the sieve. Stir together well, then add the egg whites (B) and mix well with a metal spoon to make a thick paste. Now stir a third of the meringue mixture into the almond mixture to lighten it. Gently fold the remaining meringue in, using a figure of 8 motion – you will need to do about 20-25 folds. Stop folding when the mixture has become loose and shiny – if you lift the spoon the mixture should no longer break into pieces but fall like molten lava. Scoop the mixture into a piping bag and pipe onto the prepared trays. The best way to do this is to hold the piping bag directly above the circle (not at an angle) and squeeze just until, or slightly before the circle is filled. Once all the circles are filled, bang the tray hard onto a countertop 3 or 4 times to knock the air bubbles out. Leave the trays to stand for 30 minutes so that the macarons dry out. If you touch them gently with your finger, they should have formed a skin. Bake the macarons for 8-12 minutes. Allow to cool completely on the trays. If they don’t easily lift off the paper/silicon mat, they need to dry out more. In this case you can return them to the warm (but switched off oven) with the door left ajar. To make the buttercream, melt the white chocolate (in the microwave or over a pan of simmering water), then set aside to cool to room temperature. Beat together the butter, cream cheese and vanilla until smooth and creamy. Gradually add in the icing sugar, and beat until completely smooth. Lastly beat in the cooled melted chocolate. Place mixture into a piping bag fitted with a medium round nozzle. 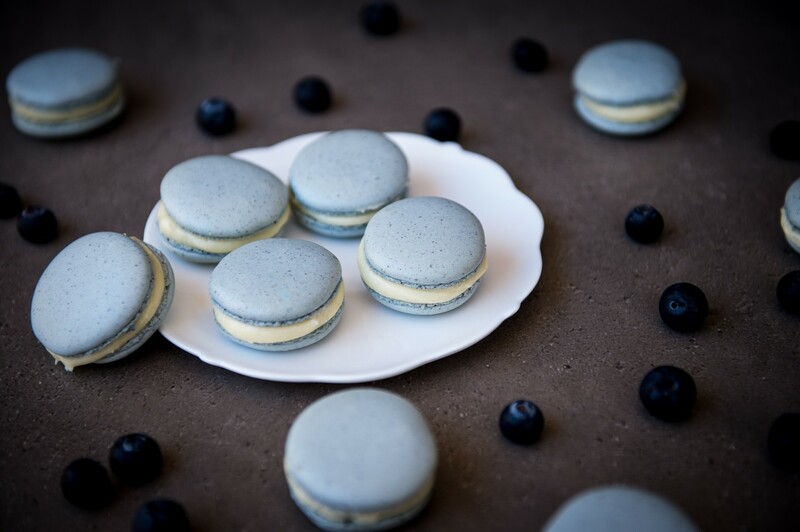 To assemble, match like sized macarons together, then pipe a ring of white chocolate cream cheese buttercream around the outer edge of one macaron. 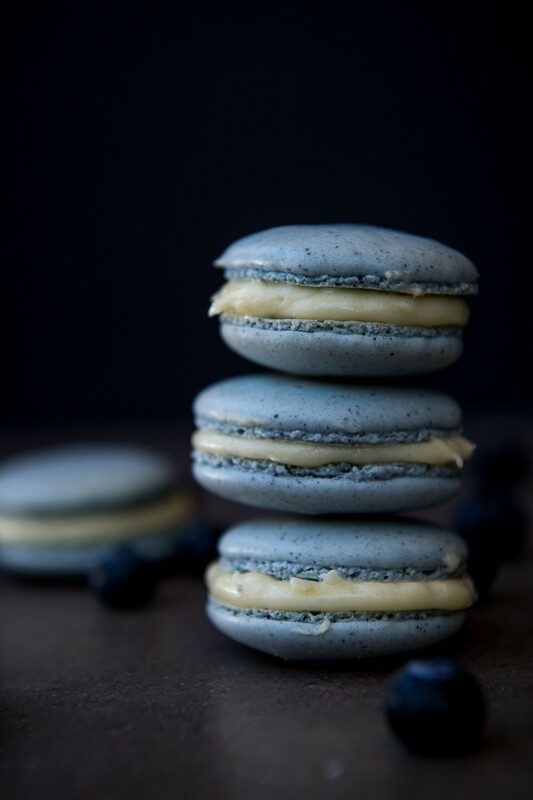 Fill the centre with a teaspoon of blueberry compote, then sandwich gently with the other macaron. Once filled the macarons are best served within a few hours. The unfilled macaron shells can be stored in an airtight container for 3 days in the fridge or up to 3 months in the freezer.